You and your students likely don’t need to look far to see examples of how single-use plastics like straws, plastic bags, and plastic water bottles are damaging the environment. Often times, single-use plastic can be replaced with non-plastic alternatives. This year for Earth Day, here are some ways you can encourage your students to reflect on how much plastic they use and how they can reduce their plastic consumption. Whether you take a stroll in the neighborhood near your school, at a local park, or along a nearby beach, there’s a good chance that you’ll see some plastic pollution along the way. Half a million straws are used in the world every day. Each minute 1,000,000 plastic bottles are purchased worldwide. In the United States alone, we purchase 50 billion plastic bottles each year. An estimated 4 trillion plastic bags are used worldwide each year. Americans throw away 100 billion plastic bags each year, which equates to about 306 plastic bags per person. Single-use plastics do not always make it to the landfill or get recycled. Thirty-two percent of the plastics produced each year flow into our oceans. That equates to one garbage truck of plastic being poured into our oceans every minute. If nothing changes, it is estimated that by 2050 there will be more plastic in the ocean than fish. When plastic collects in our oceans, it can potentially harm marine life by strangling or choking animals. Over time, large plastic degrades into small particles known as microplastics, which have the potential to release toxic chemicals. Plastic in the oceans can collect in “garbage patches,” the most famous of which is the Great Pacific Garbage Patch (which is twice the size of Texas!). These garbage patches are not solid masses of plastic, or even whole items like plastic straws and bottles. Instead, they are mostly made of microplastics. The ocean is not the only place microplastics are showing up. Scientists have found microplastics in our soil, tap water, bottled water, and even in the air. Some studies have suggested that there are more microplastics on land than there are in our oceans. Microbeads found in cosmetics are washed down the sink and clothing fibers from the washing machine end up in sewage sludge. Organic fertilizer from composted food can also become a source of plastic pollution despite efforts to remove plastic contamination. The Ocean Conservancy’s 2017 Coastal Cleanup Report complied data from beach cleanups around the world. It found that the most common trash item found on beaches is cigarettes, followed by plastic bottles, bottle caps, wrappers, and bags. Straws and stirrers placed seventh on the list. You can start small by collecting litter as a class on school grounds or in the local neighborhood. 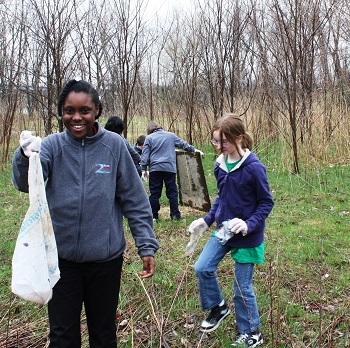 You could also join forces with other classrooms, get the whole school involved, or even work with local municipalities and community action groups to spread the word and take part in a bigger cleanup. No matter what size of cleanup you organize, students can keep a tally of the different single-use plastics they collect and determine how much can be recycled. See the activity “Reduce, Reuse, Recycle” from PLT’s PreK-8 guide for suggestions on helping students collect and analyze data on school-generated trash. Older students can use their data to write a press release for the local newspaper or school newsletter, or post your efforts on social media with the hashtags #TrashChallenge #Trashtag. With younger students, read Jo Ann Stover’s book “If Everybody Did” and discuss how our actions can have positive or negative impacts on those around us. You can also ask students to reflect on their experiences doing the neighborhood cleanup: What was it like to see all the trash in the neighborhood? Was there anything you found that we could recycle or stop using entirely? What are some ways you could make a difference in reducing plastic pollution and keeping the schoolground/neighborhood clean? –Dan Jacobson, State Director of Environment California and the driving force in getting the “straw bill” passed in California. In 1907 plastic was dubbed “the material of a thousand uses” by Leo Baekeland, the inventor of the first completely synthetic plastic. Every choice we make has trade-offs. Some plastics are beneficial and life-saving and others are potentially unnecessary and contribute to the pollution of our environment. Ask students to make a poster or presentation showing all the ways we benefit from using plastic and how it can potentially harm the environment. Are there any plastic products where the benefits outweigh the possible negative environmental impacts? Are there any plastic products we might be able to reduce or eliminate? What do we do with plastic at the end of its life? Is recycling a good option for the different types of plastics? Why or why not? In PLT’s activity “A Peek at Packaging,” students examine the pros and cons of different packaging strategies, and suggest design or material improvements to resolve problems they identify. 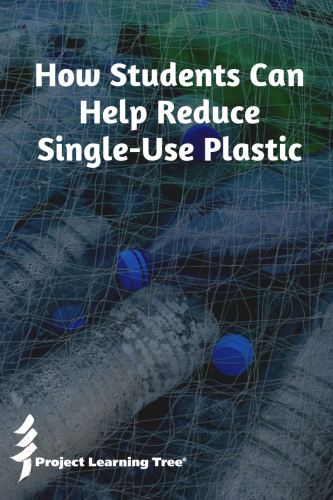 Inspire your students to organize a campaign to reduce the use of single-use plastics at school. Chloe Mei Espinosa’s story might inspire your students to take action: Her love for the sea and its inhabitants compelled her to start a straw-free school campaign at her school in Southern California. Now all 32 campuses in the Newport-Mesa Unified School District have joined the fight against single-use plastic straws. 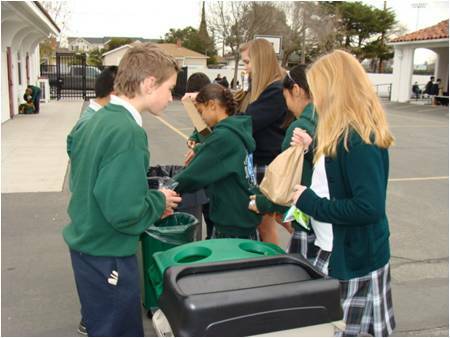 Use PLT GreenSchools “Waste & Recycling Investigation” to investigate the waste stream at your school and to help students develop an understanding of how individual and collective actions can affect the waste stream. 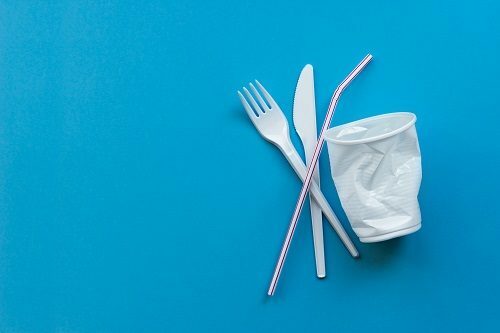 As a result, students in schools across the country have cut down on disposables, they compost cafeteria waste, they recycle batteries, milk containers, plastic bags, and other items. For ideas on how to organize and carry out a service-learning project, see the activity “Improve Your Place” in PLT’s PreK-8 guide. See also “Take Action: Success Stories and Personal Choices” in PLT’s secondary module Municipal Solid Waste for suggestions and inspiration on developing a plan for reducing waste at school. Encourage students to spread the word about what we all can do to reduce or eliminate the single-use plastic products in our lives. To help them understand possible alternatives, use the activity “Renewable or Not” in PLT’s PreK-8 guide, which explores the differences between renewable and nonrenewable resources. Then have students make posters or signs for school and at home to serve as a reminder of why it’s important to reduce our plastic consumption and what alternatives are available. The posters could include facts, photos, comics, or memes – whatever they think will inspire people to think twice and change their habits! Through the activity “A Few of My Favorite Things” in PLT’s PreK-8 Guide, students can research and analyze the energy and materials – including single-use plastic – that go into making a favorite object. Ask students to keep a journal of the single-use plastics they use over the course of a week (they could even include their whole family in the process!). They will likely be surprised to see how many times plastics are used in packaging. To take it a step further, ask students to collect all the single-use plastic products they used throughout the week and bring their collection to class at the end of the week. That type of visual can make a big impression on your students and would be a great discussion starter. You could also encourage your students to create an art piece with the plastic they collected throughout the week to make a statement that the whole school or community can see. Ask students to consider making a pledge for themselves and for the environment. Choose one single-use plastic that they will try to avoid using now and in the future. Your students may be inspired by 12-year-old Milo Cress who started the Be Straw Free campaign and take the Pledge to Be Straw Free. How will you encourage your students to reduce their plastic consumption? What types of lessons and discussion prompts have helped your students see the impact their actions are making on the environment? Let us know in the comments!